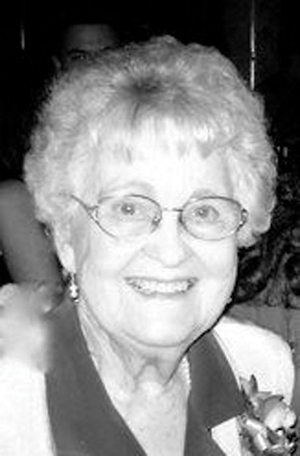 Obituary – Sadler, Dorothy Mae (Doyle) « Perry High School Alumni Association, Inc.
Dortha Mae ( Doyle) Sadler, 91, of Edmond, Okla. died peacefully in her sleep Saturday, January 26, 2013. She was born October 22, 1921 in Perry, Okla. to George Edward II and Verna Hale Doyle. Dortha attended both St. Joseph’s Academy Grammar School and Perry High School. She played the glockenspiel in the Perry High School band and at Tonkawa Junior College where she earned an Associate degree in Commerce. She later attended Central State College in Edmond where she received her Baccalaureate degree in Accounting. There she met Russel Eugene Sadler; they were married on Thanksgiving Day, 1942 in Perry. After years working as a bookkeeper in the construction industry, Dortha and Russ established Sooner Equipment Company in January 1959, the first dealers of Ditch Witch trenchers for Charles Machine Works in Perry. After Russ’ life-changing accident in 1964 leading to partial paralysis, Dortha took on the task of running the family business while being dedicated to her loving husband and her three daughters. Dortha and Russ retired in 1976 and enjoyed RV-ing and traveling with their family and friends. They were both lifetime members and docents of the National Cowboy and Western Heritage Museum, where Dortha was commended for 30 years of service in 2009. Dortha was an excellent bridge player. She also enjoyed painting, loved numbers, puzzles and solving crypto quotes without a pencil. She was quick-witted, and could spin a rhyme for any occasion. Dortha is preceded in death by her loving husband Russ; their infant daughter Dee Anne, and brothers George Edward III, Robert Emmitt and LeRoy Doyle. She is survived by daughter Donna Jo and son-in-law Col (Ret.) David Lee Holt of Hampton, Va.; daughter Jan Marie and son-in- law Jeffrey Eugene Provine of Cypress, Texas; and daughter Terri Lynne Sadler of Oklahoma City; five grandchildren, Elisabeth, Dava, Caty, Branton and Alec; two great-grandchildren, Kristopher and Anna; sister Aloma Case Edwards of Skiatook, Okla, and many nieces and nephews. Dortha was like a sister to Russ’ surviving siblings, sister Eletha and brothers Conn and Wallace and his deceased siblings, sister Mayxe and brothers Coy, James and JD and their families.